Camersoft Skype Recorder is webcam recorder software which could help you record Skype video during your chatting with others. Camersoft Skype Recorder is very easy to use. Its user interface is very friendly, and you could operate it just like a tape recorder. Camersoft Skype Recorder will capture the video and audio streaming and encode into AVI files to save on your PC. Also, you could play them with Windows Media Player or other players. ...... Camersoft Skype Recorder will be a helping tool for you in many ways for example to record business conversations, interviews, or some other important chatting. 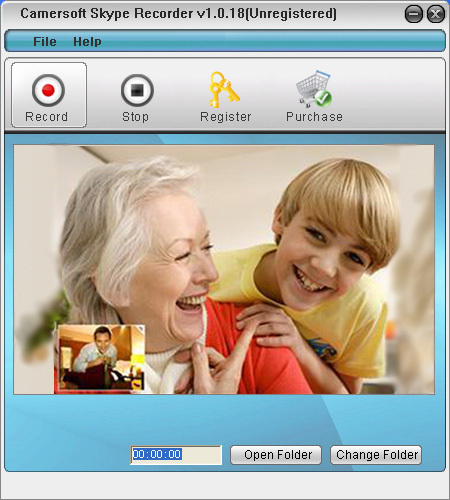 Camersoft Skype Recorder provides an easy and affordable way to record Skype call and podcast. You could free download to install and use it as just free Skype Recorder or purchase online to get the full features and functions. In addition, you could get the free upgrade service in the future after purchase. This Skype call recorder is very easy to use even for beginners. Camersoft Skype Recorder makes recording Skype call as easy as only a few mouse clicks. When you recording Skype call, both your webcam video and your friend could be recorded and saved into seperate AVI files with high quality. Qweas is providing links to Camersoft Skype Recorder 1.2.32 as a courtesy, and makes no representations regarding Camersoft Skype Recorder or any other applications or any information related thereto. Any questions, complaints or claims regarding this application Camersoft Skype Recorder 1.2.32 must be directed to the appropriate software vendor. You may click the publisher link of Camersoft Skype Recorder on the top of this page to get more details about the vendor.